The light-duty RAM 1500 has an incredible truck line in 2018, and it should be at the top of the list for testing as soon as you can! 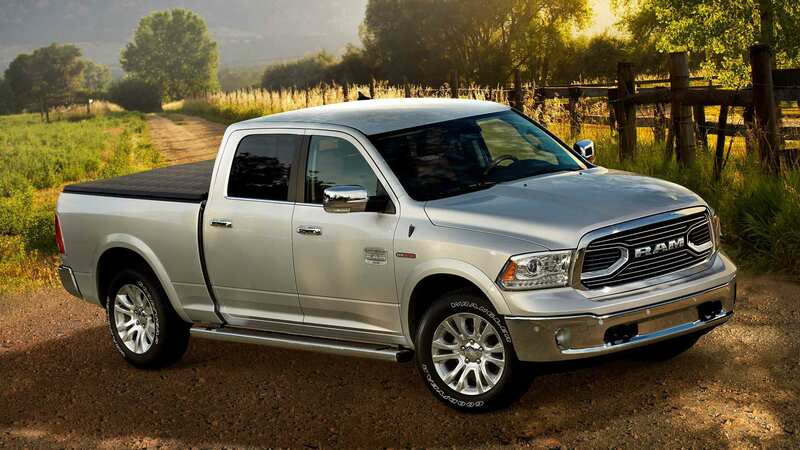 The Ram 1500 has the unique RAM Box system, access to the EcoDiesel V-6, dual transfer case choices, and a choice of either a patented coil-spring rear suspension or a 4-corner air suspension. There is a Limited Tungsten Edition that's new in 2018, as well as all trims garner a rearview camera as standard! Also possible to get now that the 2018 version is here is Sirius Guardian, a safety system that allows assistive capabilities such as an SOS Call feature, Vehicle Finder, Send & Go, Remote Services, and Roadside Assistance. There's also an 8.4-inch Uconnect touchscreen system as an option that enables Apple CarPlay & Android Auto, HD Radio, 4G LTE, gesture recognition (pinch, tap, swipe), and USB Flip. Drivers can opt for an exterior switch in the truck bed that operates LED truck bed lights, and there is also a Fleet Telematics Module for those in the business world. 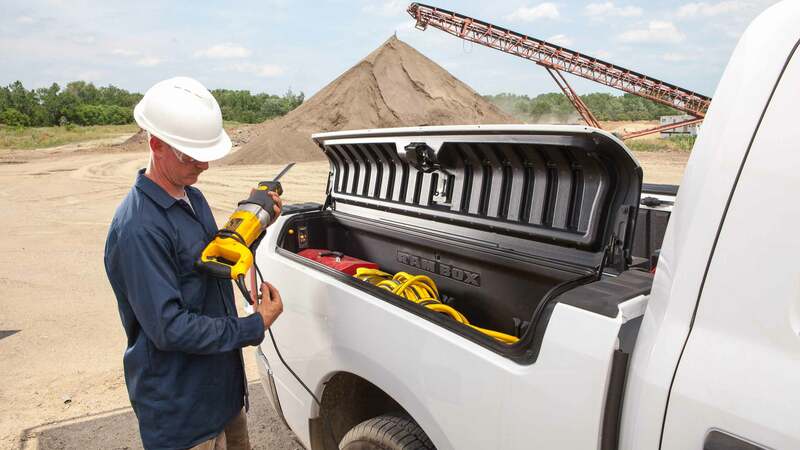 All of these details are in addition to the fact that this is a hefty, capable, customizable truck ready to get you going on the job site and beyond-- Let's explore some more right here! Sounds powerful! 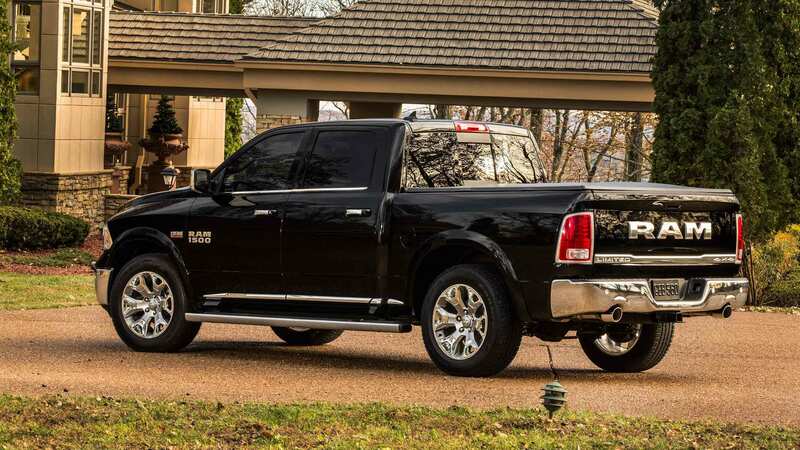 How is the RAM 1500 powered in 2018? The 2018 RAM 1500 has a choice of three engines, including the traditional 3.6-liter Pentastar V6 24-Valve VVT engine as standard, which has 305 horsepower and 269 lb-ft of torque. Don't miss the liquid-cooled 5.7-liter HEMI V8 MDS VVT Engine (gas-powered), which rocks 395 horsepower and 410 pound-feet of torque, and ups the 1500's towing numbers to 10,640-lbs. The last engine to consider is the 3.0-liter EcoDiesel V6 24 Valve engine that incorporates 240 horsepower and 420 pound-feet of torque (standard engine on the HFE model). All engines partner up with a TorqueFlite eight-speed automatic transmission (the 845RE is on the 3.6-L, and the 8HP70 is on the 3.0-L EcoDiesel & certain 5.7-L HEMI V-8). What are some typical design elements for the 2018 RAM 1500? The 2018 Ram 1500 says hello with 13 distinct models: the Tradesman, Express, HFE (High Fuel Efficiency), Big Horn/Lone Star, SLT, Lone Star Silver, Laramie, Laramie Longhorn, Laramie Limited, Sport, Night, Rebel, and the Limited Tungsten! There are 3 bed sizes possible, either 5 foot seven inches, six feet four inches, or an eight-footer. It can have 1 of 3 cab options: Regular, Quad, and Crew Cabs, plus can either be 2WD or 4WD. 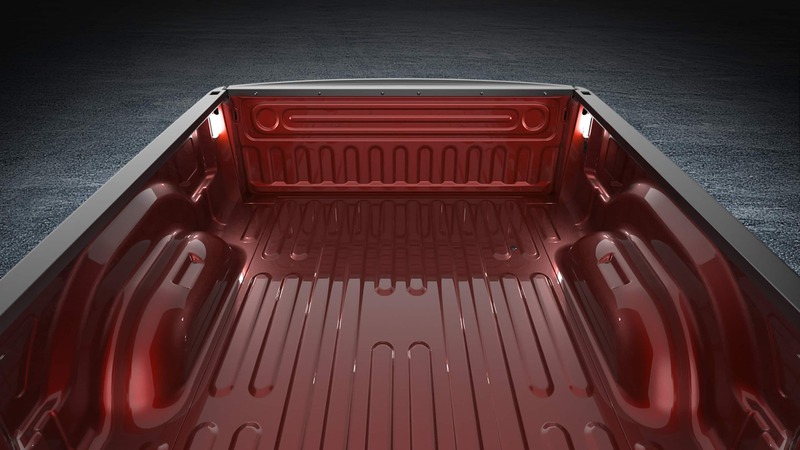 Look inside for a rear fold-flat floor feature as well as the popular Ram Box storage system, which can be lockable, waterproof, & drain-able. You can acquire a power six-way passenger seat, a power 10-way driver seat, adjustable memory pedals, and dual-zone auto temperature control. The whole truck rides evenly on proprietary spring technology as standard, which is a 5-link coil spring rear suspension that helps minimize friction in the system without losing HD towing prowess. That said, consider the purchasable Active-Level Four-Corner Air Suspension (with automatic load leveling) which also does an incredible job of keeping payloads even while driving, regardless of terrain. 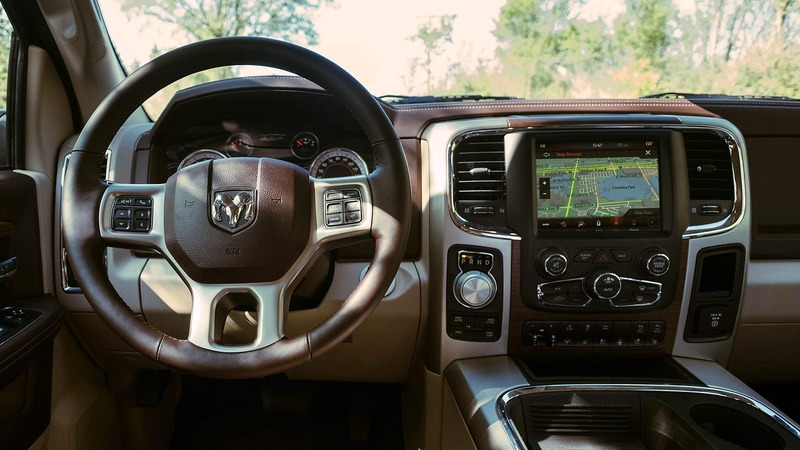 Depending on trim and setup choices, some 1500 models can have the 8.4" Uconnect touchscreen system that installs the phone-friendly apps Apple CarPlay & Android Auto, a USB Flip, gesture recognition (pinch, tap, & swipe), 4G LTE, and clear as a bell HD Radio. 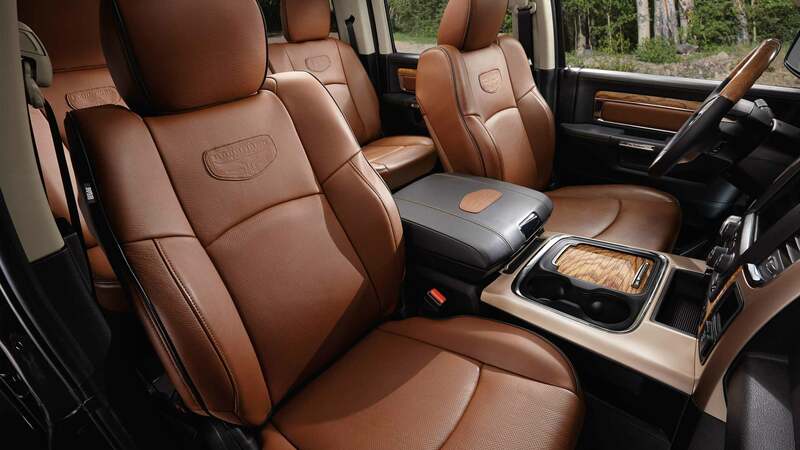 Materials inside are hardy yet appear upscale, and the center console does a great job of keeping controls centralized and efficient. What are some of the 2018 RAM 1500 model's safety & security accommodations? Mixing both available and standard features, there are features like a security alarm, the 'AllSecure' Central Locking System, ParkSense rear park assist, Remote Keyless Entry, 4-wheel antilock disc brakes, Sirius Guardian, and a 100-percent integrated Trailer Brake Control! Electronic Stability Control makes the list as do other tools of the trade like brake assist, Rain Brake Support, Ready Alert Braking, all-­speed traction control, Electronic Roll Mitigation, Trailer Sway Damping, and Hill-­start Assist. Drivers of the 2018 RAM 1500 will be driving within a high-strength steel frame, eight reinforced cross-members, and integrated tire-blockers as standard. There are Packages to look into especially if you want to outfit this powerhouse further for safety. For example, the Protection Group which has tow hooks, an exemplary front suspension, transfer case skid plates on the 4x4 versions. Also, look into the Convenience Group which has Passive Entry/Keyless Enter 'n Go, rain-­sensing wipers, and auto high-­beam headlamp control, or alternatively, the Trailer & Traction Group which has larger 7- x 11-­inch trailer-­tow mirrors, an electronic trailer brake controller, an anti-­spin rear differential and 3.55 or 3.92 axle ratio (depending on engine). Standard on all trims is a rear backup camera and 6 airbags. So if you are looking for a work truck, a daily driver pickup, and a truck with enough room for everyone in your crew, this is the one to check into further. Plus, it's not a car-like powertrain in a truck's shape-- it's instead a truck with a fully-accomplished powertrain riding on a time-tested suspension, backed by one of the top makers of trucks in the industry. 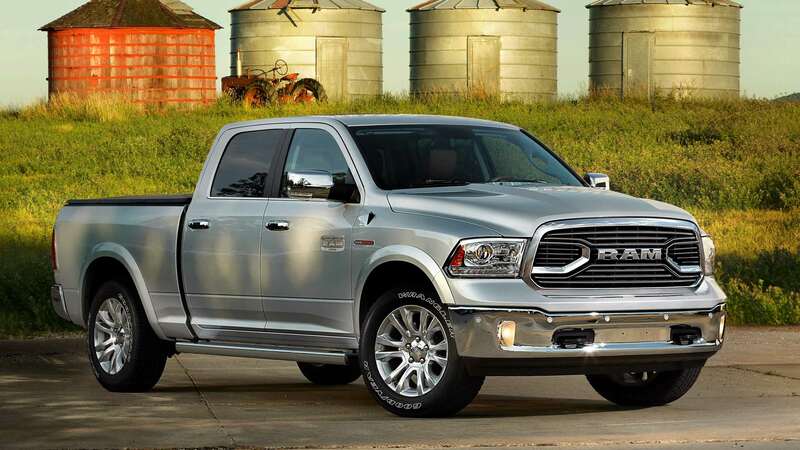 That fact stands out in today's market, and the wildly popular Ram 1500 line is ready to prove itself to you. Fired up about the 2018 RAM 1500? We sure are here at Liberty Chrysler Dodge Jeep RAM, so contact us anytime you like about this capable pickup at (912) 342 - 0787 and we will be sure to get you started!